In August 2012 I reviewed the current state of the fledgling South Bay Railway and decided that one section of the layout needed a little more interest. An aggressive ground cover had taken over one area of the layout and required constant thinning. 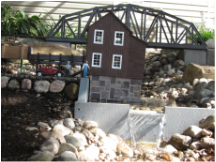 Since the ponds and rivers on the layout were always popular so I decided to add a new small creek to the layout. There were some elevation challenges to overcome. 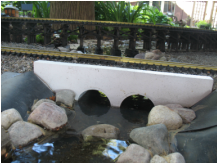 Rather than have a creek lead to another pond where the runoff drained away underground back to the lake I designed a 25 foot sluice to deliver the water to the area of an already existing river in the front section of the layout. This resulted in perfect spot for a mill - elevations permitting. I purchased a kit from 'Stoneworks' that supplied plans and parts for the wheel, control sluice, and raceway. The mill building was scratch built from photos. I added a "concrete" retaining wall from plastic lumber to create a mill pond. The mill sits on the edge of the St. John River and the mill effluent joins the flow. The mill is in full operation and in the video you'll see a couple of locals who have arrived to pick up some milled grain as trains pass by! One seems to be a little more industrious than the other. See Murray's Mill in Action! Murray's Mill viewed from upstream. The end of the 25ft long sluiceway can be seen directing water into the control sluice. Murray's Mill as seen from below with water spilling over the mill dam. Sam and Ernie are loading bags of flour into the red pickup. The creek enters a basin that collects water into the long sluiceway as it exits from under the mainline viaduct.